George W. Webb was born in North Carolina on August 2, 1820, according to descendants. George was married to Henrietta Jane Owen in Shelby County, Tennessee, on June 11, 1845, by J. S. Edwards, Justice of the Peace. 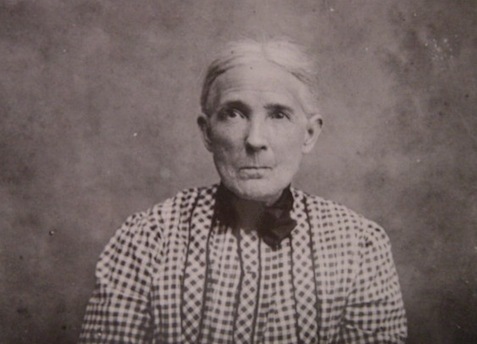 She was born November 1, 1824 in South Carolina, and is said by descendants to be daughter of Howard Owen and Mahala Foster. The couple was enumerated with one child in the 1850 census of DeSoto County, Mississippi, residing in the Southern Division, where George was a farmer. With his wife, Henrietta Jane, and family, he moved from Mississippi to Texas in the early 1850s. By1860, they were enumerated in the census of Montgomery County with four children. The youngest three children were born in Texas. George’s wife was enumerated as H. J. in 1860, and she was born in about 1824 in South Carolina. G. W. Webb joined the Danville Mounted Riflemen sometime after September, 1861. He was listed as a private on the muster roll of Feb. 14, 1862. 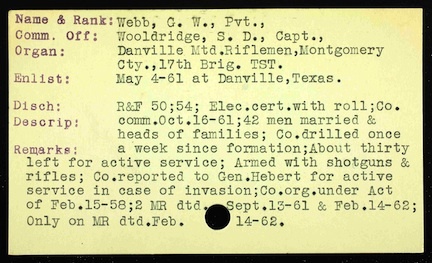 He did not join the Second Texas Lancers with Captain Wooldridge, probably because he was over age at the beginning of the war. He may have continued serving in the local militia, though no other record has been found. 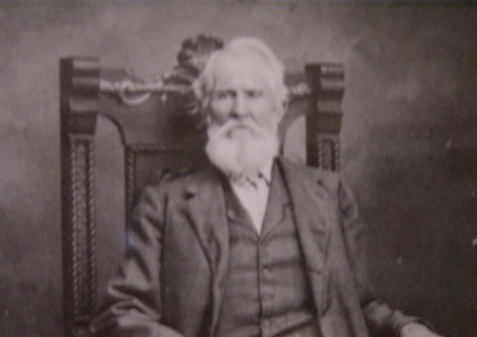 George W. and his family moved to Williamson County after the war. They were living in the area of Pond Springs at the time of the 1870 census. His wife was Henrietta, and there were five children in the family. George W. Webb, born in 1820 in North Carolina, is listed with wife Jane on the 1880 census of Montague County, Texas. Montague County is east of Wichita Falls on the Oklahoma border. Two of the couples' married daughters lived in Bee County. One of them was Sarah Lovenia Webb, who was married to Ezra Roberts. Another was Tennessee Webb, wife of John D. Love. George W. Webb died in Bee County on May 2, 1898. In 1900 and in 1910, Henrietta was living with John and Tennessee Love. She died February 16, 1916, at Clareville, Bee County. She was ninety-one years old. 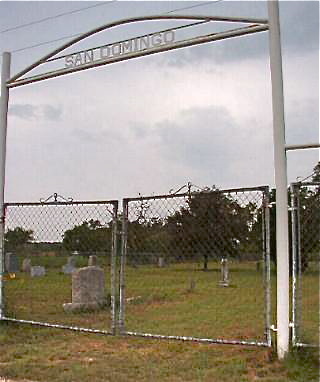 Information was compiled from county and census records and records of descendants as posted on Ancestry.com and Find A Grave. Thank you to Carol H. for sharing her research on the family. You may access her Family Tree on Ancestry. For further information and records of all Confederate soldiers of Montgomery County, Texas, as well as histories of the regiments they served in, see Montgomery County, Texas, CSA by Frank M. Johnson. The book may be purchased by visiting Frank's website at frankmjohnson.net or by contacting Frank at fjohnson@wt.net.